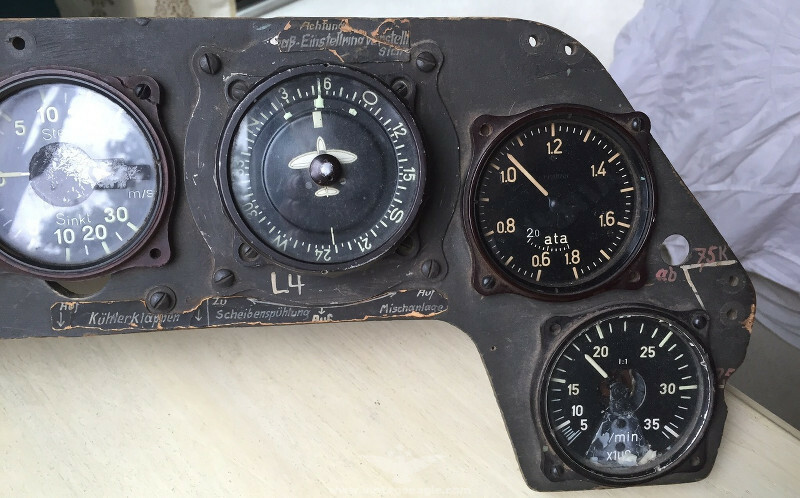 This rare original main instrument panel of a Focke Wulf Fw 190 D-9 was recently offered for sale at an auction. It is complete with all instruments and markings. 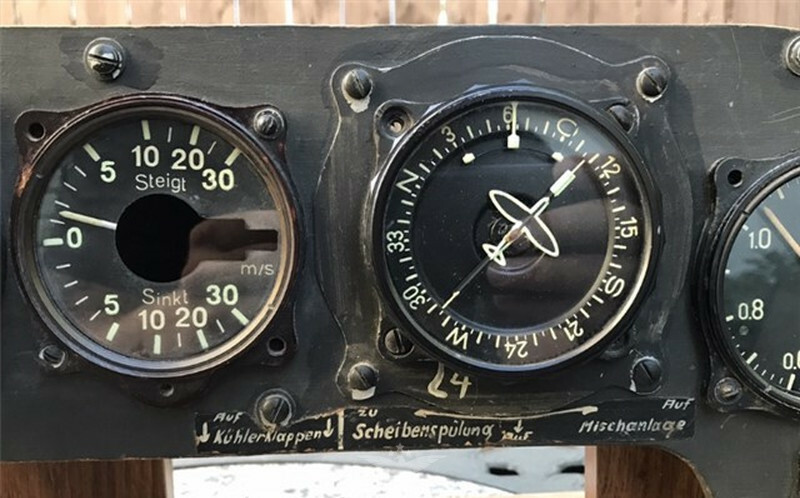 Note that the manifold pressure gauge and the rate of climb indicator still retain the original covers of the connection tubes on the backside (a bakelite cover on the manifold pressure gauge, two rubber covers on the rate of climb indicator). If the instruments had been connected with the aircraft at the factory these covers would not be present anymore. 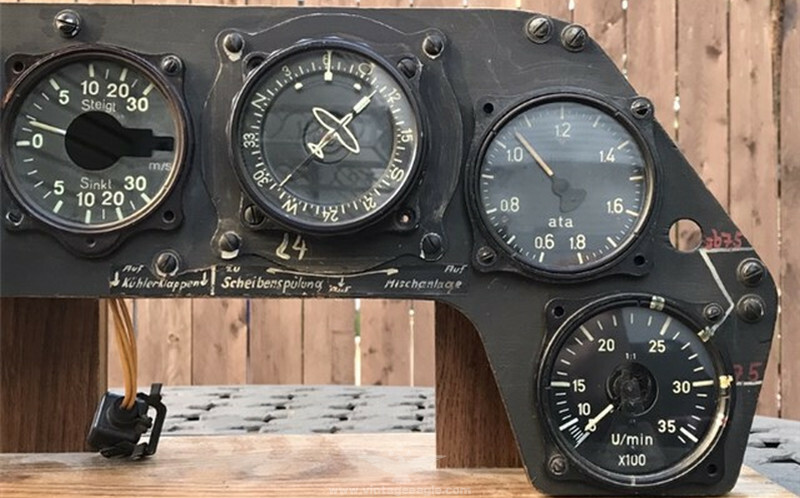 It is therefore possible that the original manifold pressure gauge and the rate of climb indicator had been missing and had been replaced by original, but unused stock instruments. 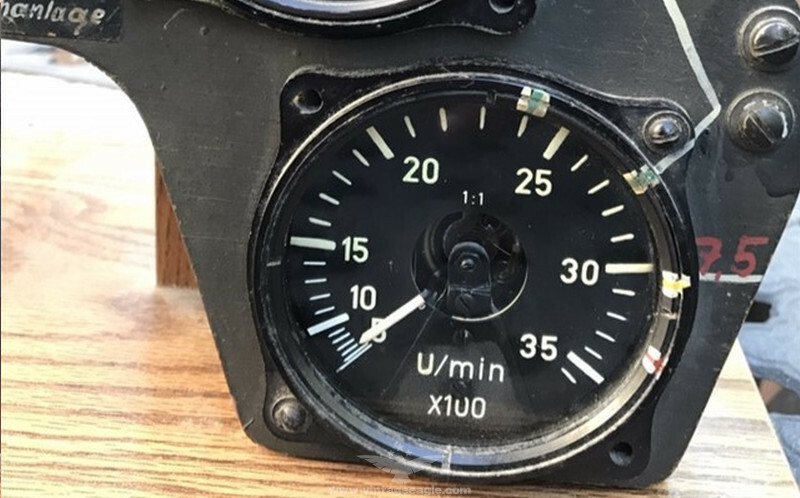 One indication that the panel had been actually installed in an aircraft is that part of the fabric/rubber tube on the altimeter is still present. Apparently, it was cut off when the soldier removed the panel from the aircraft. 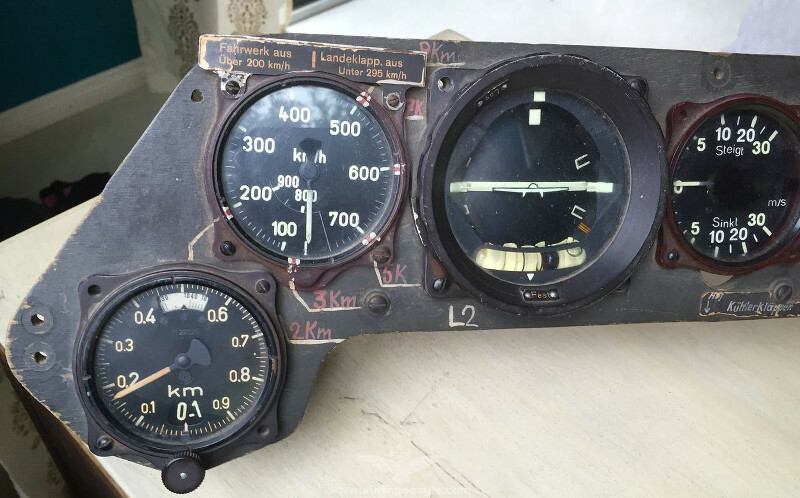 The first instrument from the left was the altimeter (Fl 22320). Note the maximum speed markings on the air speed indicator for different altitudes (second instrument from the left). 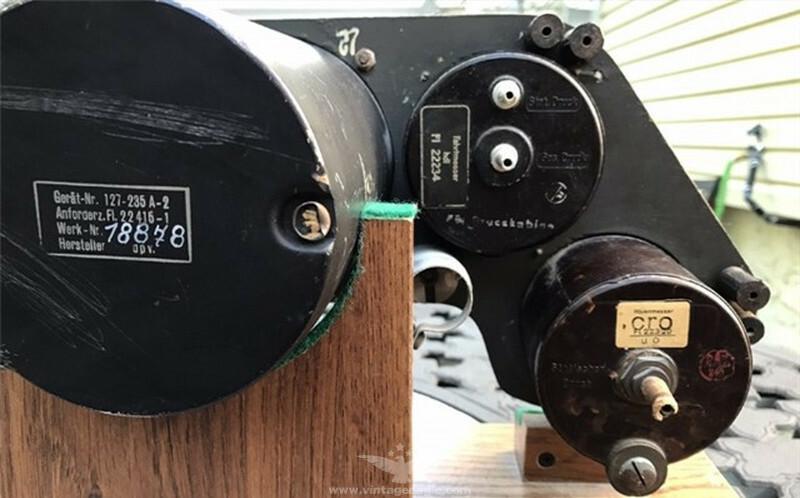 They were necessary because this type of air speed indicator (Fl 22234) was not compensated for the decreasing static pressure with increasing altitude. 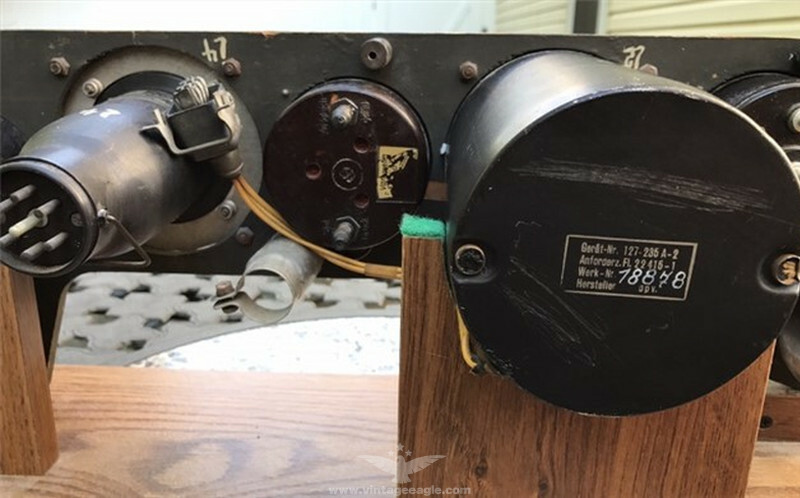 The electrical wiring diagram code ‘L2’ of the combined artificial horizon and turn & bank indicator (third instrument from the left, Fl 22415) was painted next to the instrument. The rate of climb indicator was installed next to the horizon (fourth instrument from the left, Fl 22386). This Fw 190 D-9 was apparently not equipped with a single axis autopilot. The installation of the autopilot required the large repeater compass. 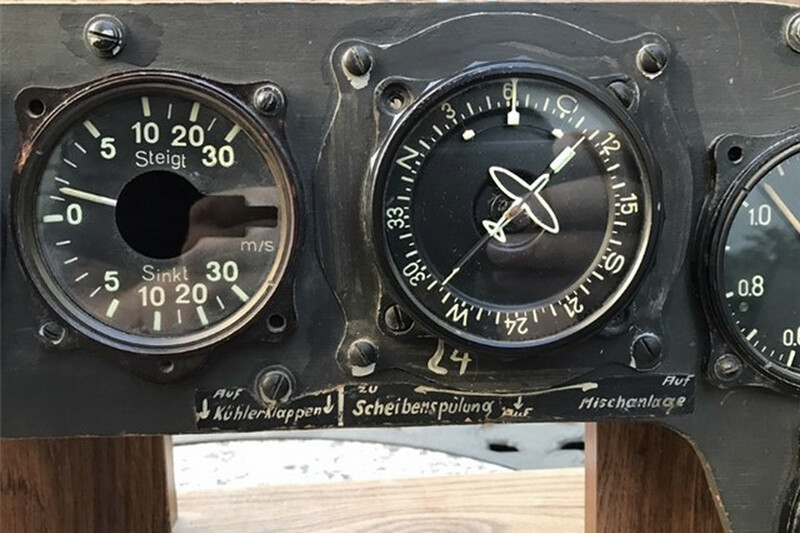 The wooden panel had a large enough hole for the large compass, but an aluminum cover with a smaller 80mm hole was installed to accommodate the smaller compass (Fl 23334). The compass’ electric wiring diagram code ‘L4’ was painted onto the cover. 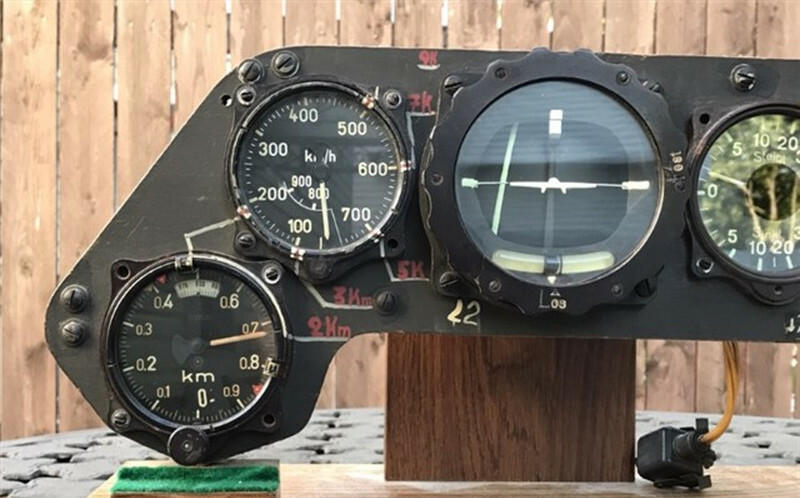 Note the cardboard instruction sign underneath the compass for the operation of the cooling flaps and the windshield washing and cold start mixture lever. Interestingly, on the instrument panel of Fw 190 D-9 W.Nr. 500666 (see our book ‘Captured Eages Vol. I’, page 34 [a]) the lever positions to stop the windshield washing or to activate the cold start mixture were the opposite (i.e. washing closed at the right position and cold start mixture at the left position). The next photo shows the manifold pressure gauge (second from the right, Fl 20555). 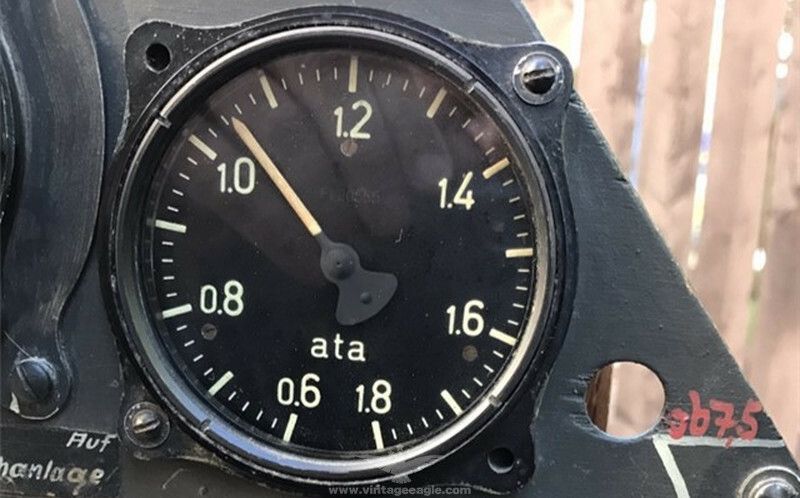 While some Fw 190 D-9 panels featured the 2.5 ata manifold pressure gauge (Fl 20554) or the 1.8 ata manifold pressure gauge with an extended range to 2.0 ata (see last photo of another Fw 190 D-9 panel), this aircraft had been fitted with the 1.8 ata gauge, which is in accordance with the Fw 190 D-9 spare parts list. 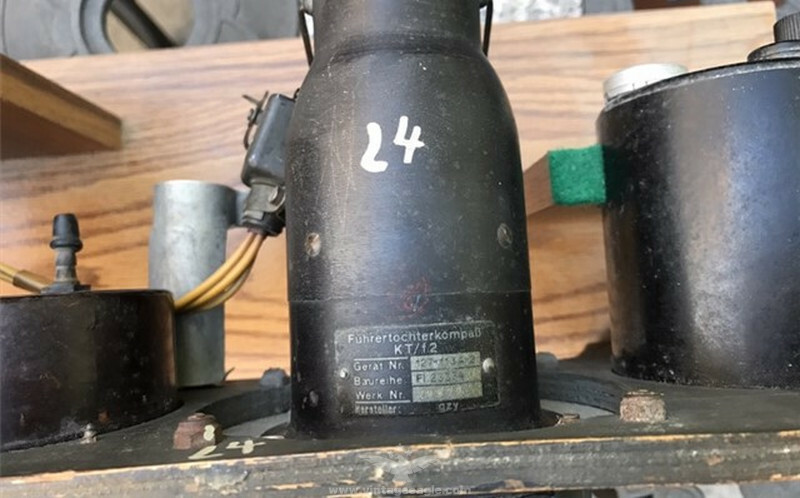 But as explained before, it may be that this instrument was added after the war as it still has the original bakelite cover on the backside, which would have been removed during installation at the factory. 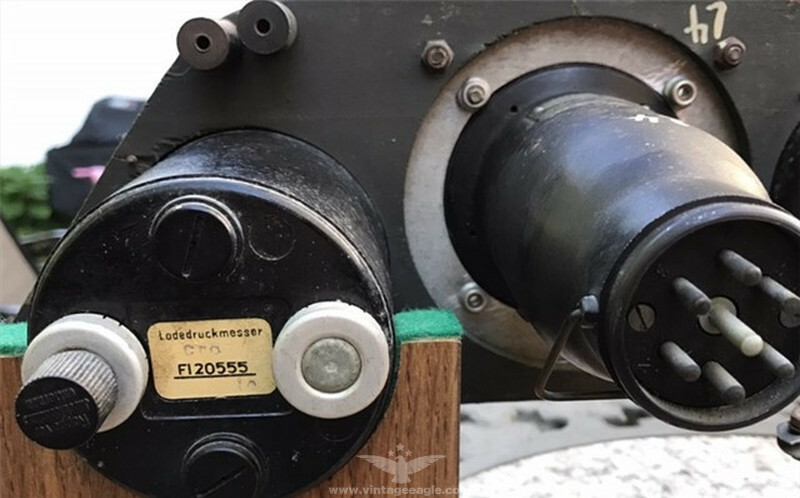 The following photo shows a close up of the manifold pressure gauge Fl 20555 and a small hole in the panel that was intended for an indicator light. It’s not clear what the purpose of the indicator light would have been, but it had not been installed. The next photo shows a close-up of the electrical rpm indicator (Fl 20269) and the rpm limits for different power settings of the Jumo 213A engine. The maximum permanent rpm speed was different at altitudes below 7.5 kilometers va. at altitudes above 7.5 kilometers. The backside of the panel shows the rubber mounts and an aluminum lamp holder at the lower center. Note the covers on the connection tubes of the manifold pressure gauge and rate of climb indicator. Note also the electrical wiring diagram codes for the compass and horizon that were also painted onto the instruments as well as backside of the panel. A close up of the backside. Apparently metal screws with nuts were used to attach the horizon and compass, while for the other instruments wood screws were used. A close up of the Fl 23334 compass showing the data plate and electrical wiring diagram code ‘L4’. The following 3 photos show another Fw 190 D-9 panel. It had a manifold pressure gauge with an extended range to 2.0 ata and a different type of horizon (Fl 22411), but was otherwise very similar. Note the additional metal instruction tag that was attached to the air speed indicator and the cardboard instruction tag above the compass. The former indicated air speed limits for the landing gear and landing flaps and the latter warned the pilot that the compass setting may change over time.